A standing-room only crowd was treated to an air show during Cannon County's District 8-AA opener against rival DeKalb County at Schwartz Field Friday night. DeKalb County bombarded the Lions (0-3) with an aerial assault that included four touchdown passes from quarterback Shane Salley - two each for Kevin Kijanski and Matthew Giles - as the visiting Tigers secured a 34-7 win. Justin Tobin accounted for Cannon County's only touchdown for the second straight week, a 22-yard end around to whittle the deficit to 27-7 early in the third quarter. Heath Simons threw for 170 yards and Gabriel Walkup had 131 yards total offense, while Jordan Linder continued to emerge as a go-to receiver, but it wasn't enough to muster much of a threat against the Wildcats. "When it rains it pours," Cannon County Head Football Coach Joel Schrenk said. "We have to keep working and improving. We were better in some areas tonight but there clearly is still a lot of work to do. We have have to keep improving and put it together." Schrenk warned that the secondary would be a question mark early in the season after losing three starters from last year's playoff team. Three of the four Lions in the secondary against DeKalb County were first-year starters, and Salley picked on them early and often. 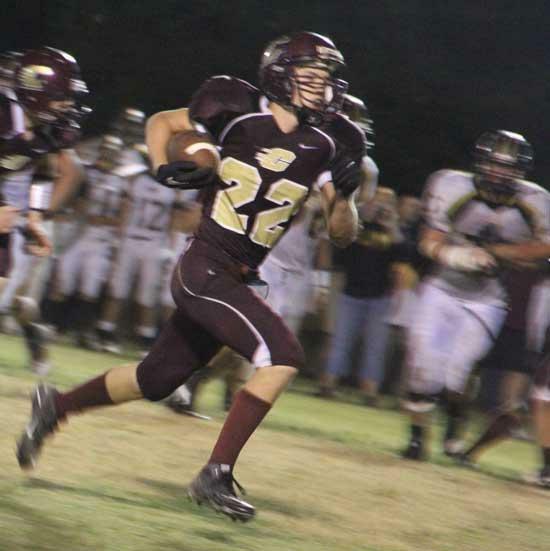 His two third-quarter touchdowns stuck the dagger in Cannon County's hopes but two of the touchdown passes in the game clearly were the result of the Lions inexperience. Salley's second touchdown, which staked DeKalb County to a 19-0 lead, was a 17-yarder to a wide open Giles in the back of the end zone against busted coverage; however, the back-breaker was his 32-yarder to Kijanski to complete an unusual drive. Cannon County had closed to within 27-7 on Tobin's 22-yard run and Colin Jones' subsequent extra point with 8:33 remaining in the third quarter and, desperately needing a stop, the Lions had the visitors in a dire third-and-27 situation at their 32. Cannon County appeared to finally catch a break when a bad snap went over Salley's head. The alert quarterback scampered to the ball, picked it up and heaved it downfield, where Giles made a 32-yard catch to keep the drive alive. DeKalb County capped the drive when the same two hooked up on a fourth-and-29 at the Lions 32. "They made a lot of plays in the passing game but there were three real big ones," Schrenk said. "We are having to learn on the go right now and we are doing it with some guys who haven't been out there before. They get a touchdown when a receiver goes uncovered and they complete a fourth-and (29) play for another one. At that point the coach in you wants to chew them out but that is not what they need. They need to learn how football is played. Our football IQ is not real high." Another recurring theme was on display as Cannon County fell behind early and had to play from behind throughout. The Lions have yet to score a first-half touchdown but they were still in the game at the break against DeKalb. Moving the ball was not as much of a problem for Cannon County as sustaining drives was. The Lions had eight drives that reached Tiger territory, including four inside the 35, yet, they managed only one touchdown. One drive ended with an interception at the 20 and the other resulted in a touchdown when Kijanski returned a fumble six yards for a score to give DeKalb County a 13-0 lead six minutes into the game. Walkup led the running game with 69 yards rushing and also hauled in a 62-yard pass, and Damon Collette had his best ground game with 46 yards on 11 carries. Linder enjoyed a career-high four receptions for 47 yards. Colin Jones bounced back from a collarbone injury to catch three passes for 25 yards, while Justin Tobin and Collette had two grabs each. Simons completed 12-of-33 passes for 170 yards. Cannon County will look to get untracked when it travels to face Donelson Christian Academy Friday.